Their estate value totals an estimated £1,150,000, they currently have a projected Inheritance Tax (IHT) liability of £200,000. They have four children and have wills that leave their monies on the second death to their children equally. Two of their children are married, one was married but is now divorced. The fourth is in a long term relationship and has a child with his partner. They would like to take steps to defend their estate from IHT and to ensure any inheritance remains with the family bloodline; they are concerned that a divorcing child (which they have experienced once) could leave a situation where the inheritance partly ends up outside of their family. They require their savings and investments to support their retirement income. 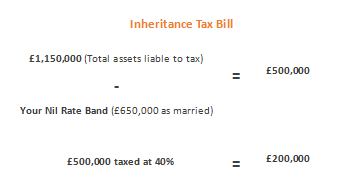 The object of the exercise is to reduce the asset values so that the IHT is mitigated and also to ensure that any inheritance is protected from divorce of a child. Dr and Mrs Johnson do not want to lose control of their savings and investments so they would not want to gift these outright. Their investments are largely in ISAs using a balanced risk approach. They have reasonable pension income. Their life expectancies (between the two of them) means that the median timeframe to consider realistic is around 25 years. – A Family Trust will ensure that any legacy can be provided with suitable protection to ensure the value of the legacy remains within the family bloodline. – They can consider whether their investments, currently largely in ISAs, would be better held under a structure which qualifies for Business Property Relief, creating a 100% IHT exemption on any amount invested after 2 years. – 7 Year gift to provide income and create a potentially exempt transfer. – They can put in place a Whole of Life Assurance Plan – written under a trust – to provide a protected pay-out to the trustees of the Plan of £200,000 which can then be used to clear the IHT liability. Naturally they could use a combination of one or more of these to meet their objectives. Trusts are especially useful to them from the point of view of creating control over the direction of where their assets will go. The trust mechanisms allow for a very high level of control mixed with an effective protection against IHT. If you are considering trust be sure to seek advice, just like Mr and Mrs P.